Traditional tuners can keep your instrument in tune but their abilities are somewhat limited. 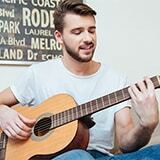 Everyday wear and tear can cause your guitar to keep getting out of tune. Not to mention the influence of different temperature conditions. So, you've decided to upgrade your guitar with locking tuners, but you're somewhat suspicious and it's not an easy decision to make. Yes, it's true, your headstock needs to be drilled, and I know that it can be a scary proposition to drill holes in your precious baby. If you've decided to give it go, let me show you some of the best locking tuners, so that your axe can stay in tune no matter what the situation is. Read on to check out 5 of my favorite locking tuners for guitar. In case you've lived under a rock in recent decades, Grover is one of the most reputable names in the music instruments industry. Ever since the late 1800's they have specialized in making some of the most respectable machine heads for all sorts of guitars, banjos, bass guitars, and other string instruments. Of course, with this reputation you'd expect nothing short of excellent when Grover locking tuners are concerned. 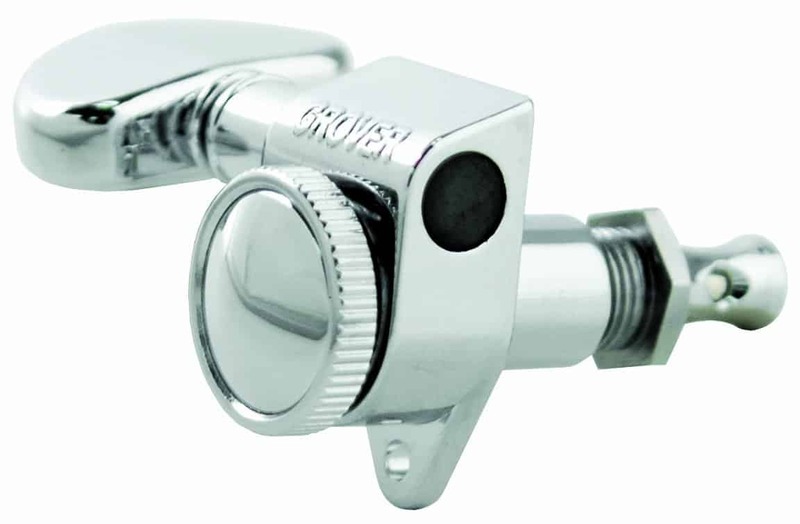 The Grover 502C locking tuners require a drop-in installation and they are meant for guitars that use a 3x3 tuner configuration. Sorry, Tele and Strat guys, these aren't meant for your beauties. You don't need any tools or hardware for the installation, as the package includes everything you need. This will save you from paying a visit to your local guitar shop. The installation is an easy process, and it calls for just a one-time string wrap before you can lock it in place by using a thumb screw. When it comes to finish options, you can choose between gold, chrome, and black chrome, which should suit most guitars. Going for these, you might break the bank a little bit, but I'm sure you won't be disappointed with the results. Ever since its inception in 1977, Sperzel has been associated with some high quality products. They are known worldwide for delivering different sorts of machine heads, with an emphasis on custom designed products. Actually, they were the ones to introduce the first locking tuners to the world, way back in 1983. They often supply tuners to big-name guitar companies, so they really make some of the best models of locking tuners available out there. Unlike the previous ones, the Sperzel 6 locking tuners are meant for guitars with an inline 6 headstock configuration. Gibson and Paul Reed Smith guys, you should probably skip this one (it's your turn now). 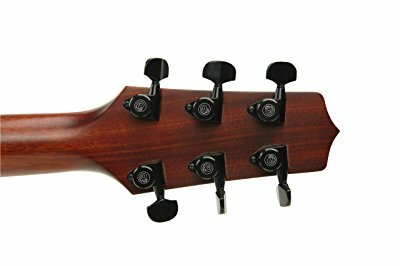 Probably the best thing about these Sperzel locking tuners is that they are staggered in height, and as such you don't really need to use any string retainers. The response across the strings is rather sensitive and open, and the tune really stays intact, even under heavy abuse. They have a reputation for being able to open up your guitar tone and they are among the most popular guitar upgrades among enthusiasts and guitar techs everywhere around the world. One of the most iconic brands in the world of guitars, Fender has been around since 1946. Almost every guitar player has a favorite, be it a Stratocaster, Telecaster, Jazz Master, or perhaps a Jaguar. It's no wonder these locking tuners come standard on their line of American Deluxe guitars. In case you don't own one of these, or even if your guitar doesn't bear a Fender logo, rest assured that the Fender locking tuners could be an excellent upgrade over your standard set of tuners. 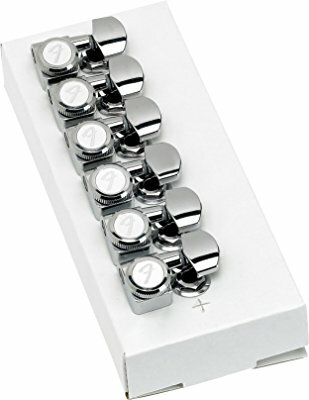 Keep in mind that these are meant for guitars with an inline 6 headstock configuration, so installing them on a Fender guitar is straightforward. They’re not difficult to install on other guitars either. The tuners look and feel well-built so they should provide you with countless years of in-tune performance. Some of you may dislike the fact that they only come in chrome-plated finish, but it actually works well on most guitars. Schaller is a German company founded in 1945, and it was always one of the most reputable players on the market of high quality guitar components. Their machine heads are a common sight on high-end guitars and are highly regarded by numerous guitarists as the best in business. Schaller owns the original patent to locking tuners. 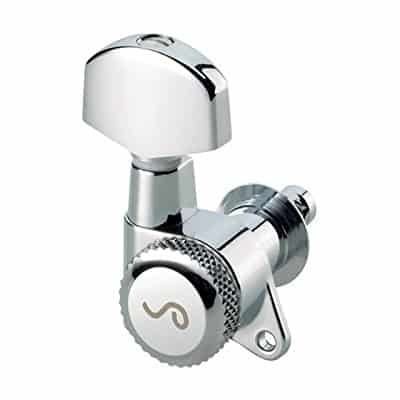 Each of these Schaller locking tuners locks the string in the peg by utilizing a knurled nut. This means that the mechanism actually operates as if it wasn’t really a locking nut, but the string itself doesn't actually get wound around the peg. Its end just needs to be inserted through the hole before getting locked with a screw, and that's all there is to it. As you'd expect, the build quality is top-notch, but once again I'm somewhat disappointed with the fact that it only comes in chrome finish. When compared to Fender's locking tuners, it isn't that much of an eye candy, but it does hold the tune tight, no matter what you're doing to your guitar. As an added bonus, it can be used on different headstock configurations. Planet Waves is known for affordable yet high quality products for guitar enthusiasts. For years they've operated under D'Addario, one of the largest musical instrument companies in the world, specializing in strings. If you've grown familiar with their line of products, you're definitely gonna love these locking tuners, as they are some of the best I've stumbled upon. They come loaded with some quite innovative features that I haven't seen on competing products. 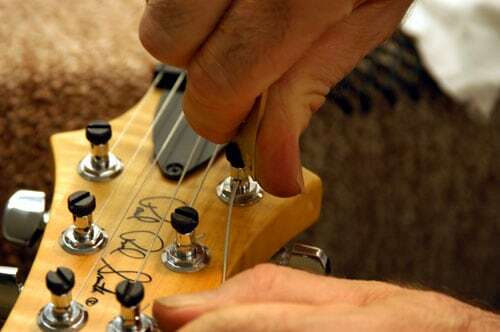 Even though their visual appearance isn't something to write home about, they do feature a clamping method which automatically cuts the excess string once it is properly tuned. It's also worth pointing out that their gears come with an 18:1 ratio, which means you get the utmost precision during the tuning process. The tuners feel well-built and that's completely confirmed by the fact that they come with a lifetime warranty. Those of you who have a thing for tremolos are going to love these. Simply put, locking tuners minimize the tuning out of your strings. I totally understand that you don't want to spoil your beautiful vintage guitar with modern products. Also, you don't want to damage the body or the headstock by drilling any holes. However, if you don't mind slightly modifying your guitar, you'll do a good thing and thank me later. Don't forget to consider the fact that the process of changing the strings is much more convenient with locking tuners. It will save you a lot of time, especially if you own more than just one guitar and if you're playing a lot of gigs. This might be one of the main reasons why this is a good long-term investment. Depending on the model of your guitar, always take into consideration the locking tuners' design as some of them don't fit inline 6 headstock configuration. If you're a Gibson player, also make sure you choose the tuners meant for 3x3 headstock configuration. Locking tuners aren't that expensive generally, but if you plan on installing them you'll surely be guided by your budget. You can't really go wrong with any of the products listed here, so you'll probably be guided by their visual appearance, ease of installation process, and overall performance. 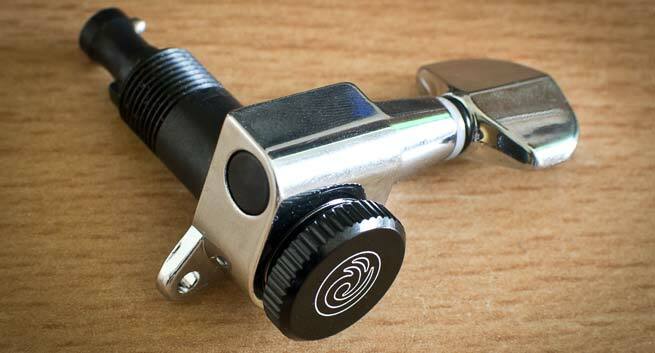 Hopefully, this list will help you choose the best locking tuner for your guitar. All of the listed products come with their own benefits, though none of them are perfect. Perhaps it's best to take your baby to your local guitar shop, so that you can determine which one of these will fit your guitar the best. Make sure you choose the locking tuners that will help your strings resonate better and open up your guitar tone.